So instead of posting which is what I normally spend my first hour of the work day doing, I am browsing around Facebook. So far it seems pretty fantastic, but I've just joined so it is hard to tell ... Although I do seem a little slow on the uptake there since loads of people I know already seem to have joined! Anyway, there are loads of these network type things so we'll see how this one goes. Years ago I tried LinkedIn as well, but that was equally boring after a while. So, yesterday evening was good, Varen & I went to watch Music & Lyrics. 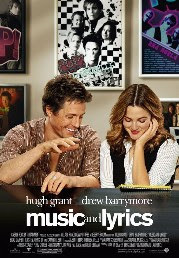 Music & Lyrics follows Alex Fletcher (Hugh Grant), a washed-up 80s pop star who's been reduced to working the nostalgia circuit at county fairs and amusement parks. The charismatic and talented musician gets a chance at a comeback when reigning diva Cora Corman invites him to write and record a duet with her, but there's a problem - Alex hasn't written a song in years, he's never written lyrics, and he has to come up with a hit in a matter of days. Enter Sophie Fisher (Drew Barrymore), Alex's beguilingly quirky plant lady, whose flair for words strikes a chord with the struggling songwriter. On the rebound from a bad relationship, Sophie is reluctant to collaborate with anyone, especially commitment-phobe Alex. As their chemistry heats up at the piano and under it, Alex and Sophie will have to face their fears – and the music – if they want to find the love and success they both deserve. Enough of that ... This morning on my way to work I generated quite a rant at the silly South African truckers. Hello ? I know, I know ... silly us, we don't have an effective rail system and therefore have a marvelous job-creation opportunity for masses of South African drivers who can truck our produce and merchandise thruout the country. But it's still annoying! These silly trucks cause as much traffic havoc as our ever-present taxis during peak times (can't really refer to it as rush hour here in Jhb as it lasts for most of the day!). And this morning is some wriggly suburban road en route to work I got stuck behind a truck. And it wasn't even an impressive truck, mind you. It was fairly mini compare to some of the oil-tankers we have cruising our roads. But none the less, this ridiculous mode of transport couldn't manage to get over 40kms and hour! I mean really, at least drive the speed limit! And I couldn't even over-take ... nothing like truckers to remove your morning smile. Blegh. Yup I do, got it last week and have struggled to do any real work since ;) Loads of old high school friends to catch up with! Unfortunately it hasn't been loading very efficiently today ... hmmm, has work blocked another of my favourite sites along with gmail? Yes, I noticed that earlier today already ;) So, I guess my next question for you both is how do you know each other ? ?